After our brief stay in Lima, we boarded a flight to Cusco. Once we landed in Cusco we began the drive to Urubamba in the Sacred Valley at 9,420 feet elevation. During the Incan Empire, Ollantaytambo was the site of the royal estate of Emperor Pachacuti and also served as a ceremonial center. Ollantaytambo was a good “warm up” to the Incan ruins and architecture that we would see later on the trip at Machu Picchu. En route to our hotel, we were treated to an authentic Peruvian meal prepared by a local family. So, of course there was cuy on the menu. Yes! (When in Rome…er, when in Peru, rather…). Cuy tasted more appetizing than it looked (although, you see the picture – that’s a low standard since it more or less resembled deep fried rat). It had a bit of a “gamey” taste, and it was difficult to get more than a small bite of meat since a guinea pig is mostly skin and lots of tiny bones. 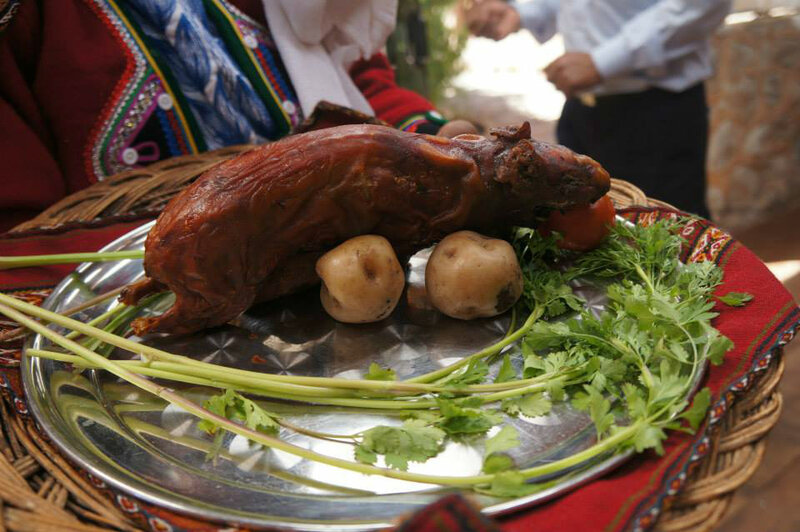 Aside from the cuy, all of the traditional Peruvian food was delicious. After we ate, the woman in the village demonstrated how they weave alpaca wool and dye it using natural plants and berries. By the time we arrived to San Agustin Hotel, we were exhausted, but we were delighted to find that the hotel was lovely! The rooms were large with comfortable king size beds, and the grounds of the hotel was gorgeous. Although just outside the city center, it was a short walk to the middle of town where a handful of restaurants and shops could be found. 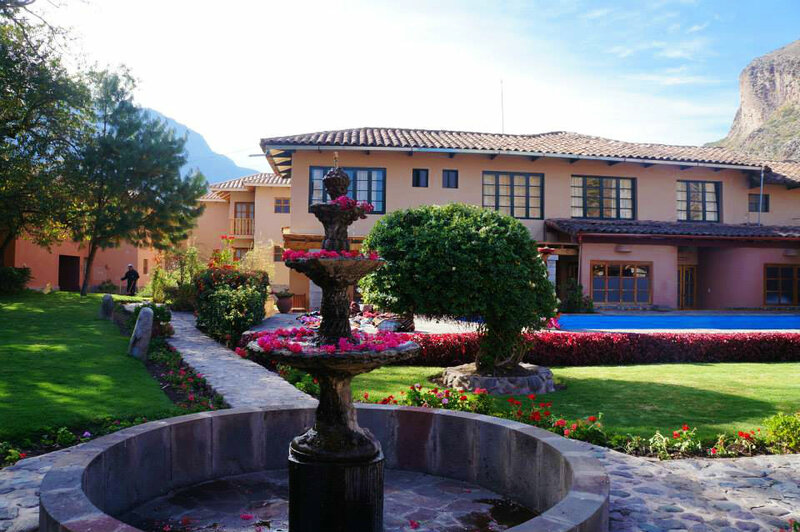 This hotel was a huge step up from the one in Lima, and I would certainly recommend it to fellow travelers. The next day was a “free day” on our own in Urubamba. We opted not to take the optional organized tour and instead planned our own day of horseback riding in the Andes… this turned out to be a wise choice, because (aside from seeing Machu Picchu) the day we spent on horseback in Urubamba was my favorite day in Peru! After spending quite a bit of time researching different companies for our horseback trek, we chose to book with Apupacha Horse Adventures for our private guided trek and tour. Although it was an expensive day by Peruvian standards (about $110 per person), it was well worth it. 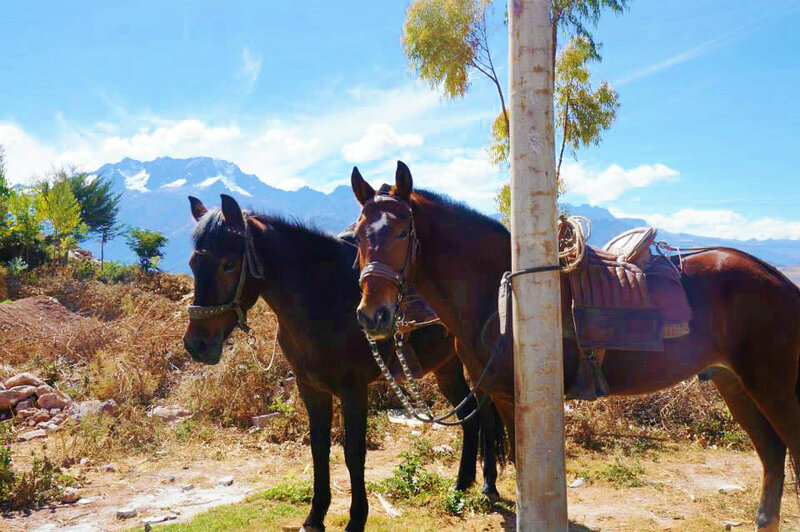 We chose Apupacha because we wanted a guide who we felt safe with and a company that treated the horses humanely. I had read several articles and reviews on other companies who keep their horses malnourished and fail to tend to the horse’s hoofs, which need constant attention since the animals are trekking the rocky mountains day-in and day-out. Our guide picked us up from our hotel in the morning and drove us to town where our horses were waiting for us. 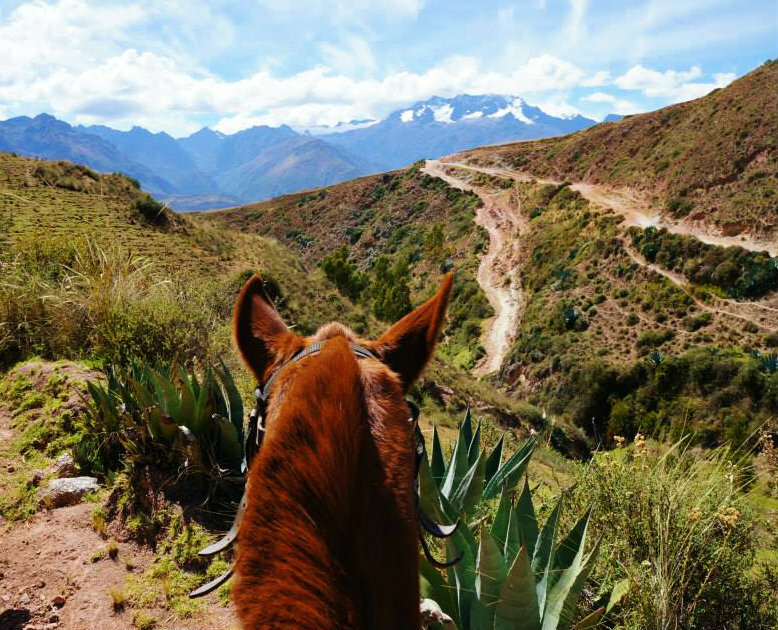 We left the city and began our adventure by riding into the Andes! Naturally, I had the most stubborn and naughty horse. On more than one occasion my horse stopped dead in his tracks and planted a backwards kick to my husband’s horse. (I swear I had nothing to do with it…)! After a few hours on horseback, we came to the ancient archaeological site of Moray. 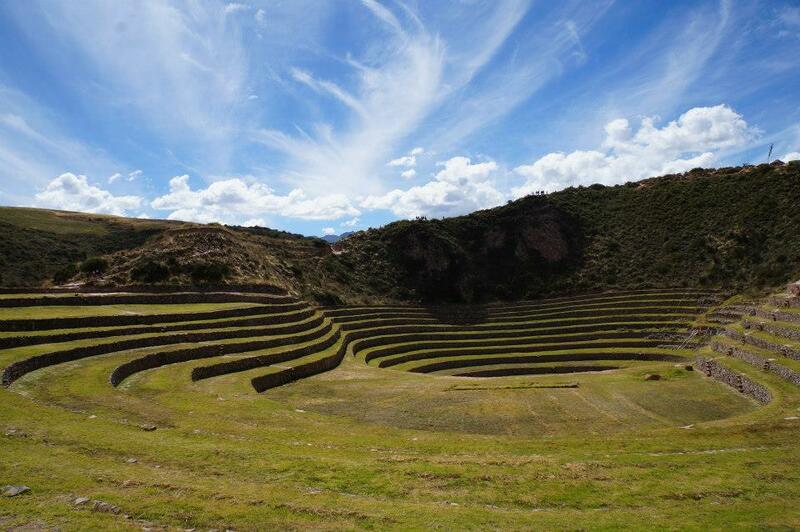 The Inca ruins at Moray are large, terraced circular depressions that archeologists believe the Incas used to study the effects of different climate conditions on crops. After exploring the ruins, we continued our horseback journey. The vistas were incredible… some of the most beautiful that I have seen anywhere in the world! We rode through farms, over streams and on mountain ledges (so high and steep that I had some anxiety during these portions of the trip). After riding a bit longer, we stopped near a creek to allow the horses to eat and drink and to enjoy our picnic lunch in a small shady grove. The lunch provided by Apupacha was a filling spread of chicken, fruits and vegetables. Following lunch, we continued on horseback for a couple more hours with one last stop for the day – the village of Moras. 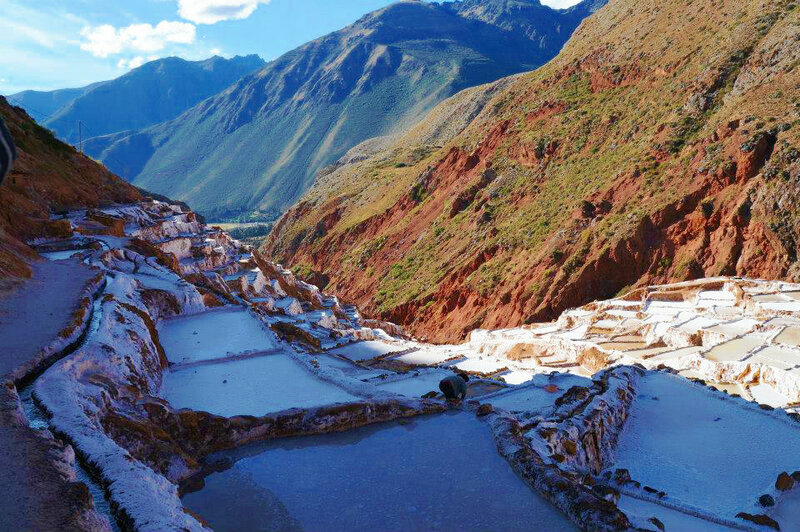 Moras is known for their terraced salt evaporation ponds that have been used to cultivate salt since the Incan times. Admittedly, salt mines didn’t initially sounds too exciting to me, but they were actually very pretty. It was an enjoyable, short stop before heading back to town. By the time we were dropped off back at our hotel, we were exhausted and sore from a long day of riding. We headed to bed to get a couple extra hours of sleep before we had to wake up early the next morning to start the most anticipated day of our trip – Machu Picchu. Gorgeous gorgeous scenery! I went to South America for the first time this year but only to Brazil Argentina and very brief time in Chile – Peru is next on the list and I’d love to have a chance to see these stunning places myself! 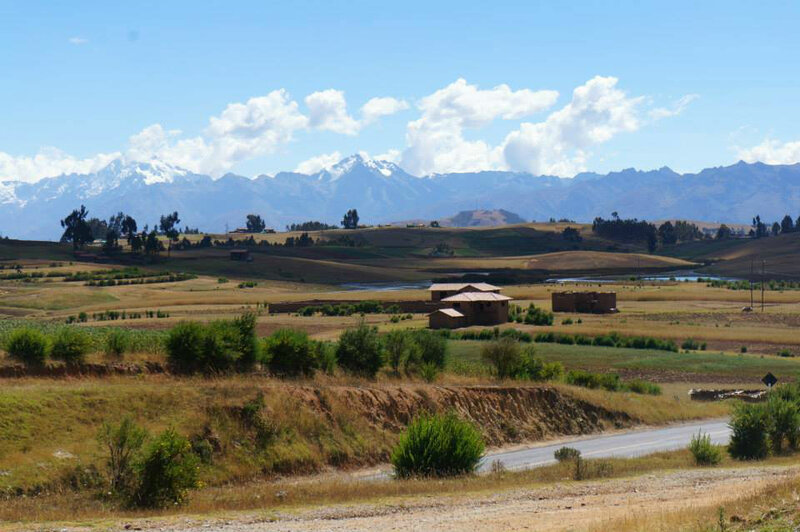 Shikha, I was blown away by how colorful and gorgeous the Andes were in person! Argentina and Chile (Patagonia) is next on my list for South America! OMG! The scenery is AMAZING!!! Next time we go to Peru, we will definitely explore the archaeological site of Moray, and the salt terraces in Moras! Thank you for sharing your inspiring experience! Cheers, Mei & Kerstin. Just wanted to stop by and say hi! You took beautiful pictures. I actually did the Salkantay trek last year, so this article brought back familiar memories! Thanks! I did not know that you could do this trip by horse. When we were in Peru, we hired a cab, which is maybe cheaper, but surely not nearly as nice! And yes, to me as well, Moray & Maras were a highlight in Peru. 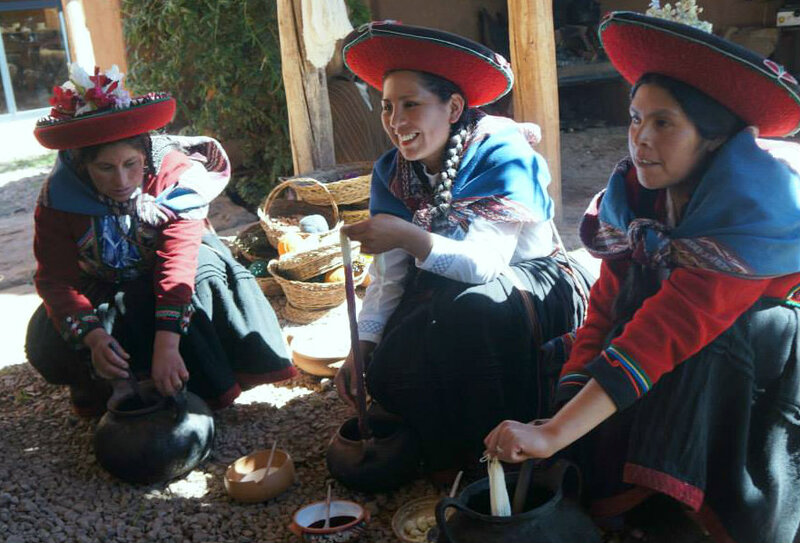 The village women look wonderful in their colorful traditional dress. 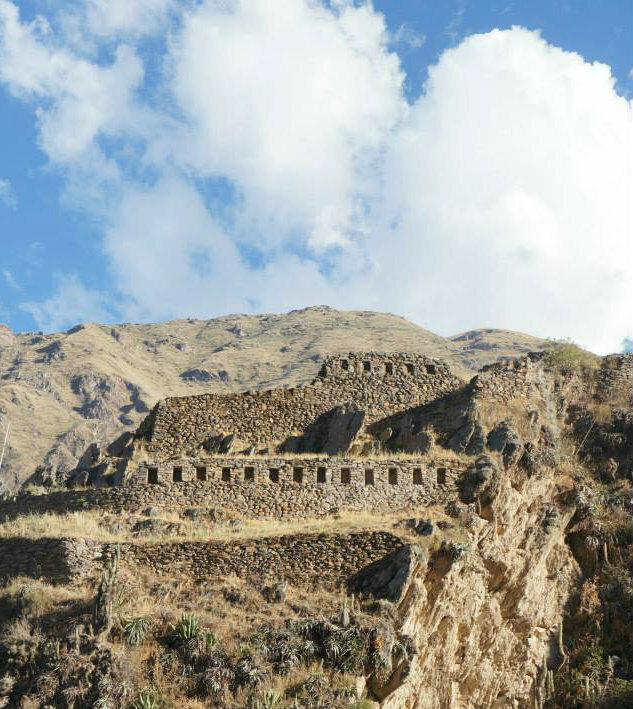 I’d have to pass on the guinea pigs, my grandchildren have two as pets.Beautiful scenery, I would love to do this trek, The ruins at Ollantaytambo looks amazing. Of course Manchu Pichu would have to come next. I’m so envious! Yes! You should definitely put Peru on your list. How very beautiful. I’ve heard about Machu Piccu, but not some of these places. 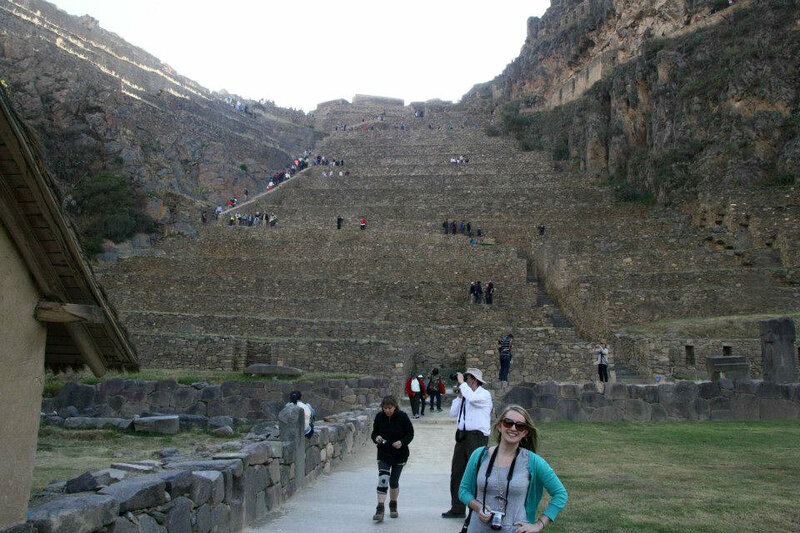 I enjoyed the Sacred Valley as much as MP, if you can believe that! Wow, having had a live one as a childhood pet – won’t be able to keep that cuy down! 🙂 great read, something different from machu pichu! HA! Thanks JayZee. That literally made me laugh out loud. 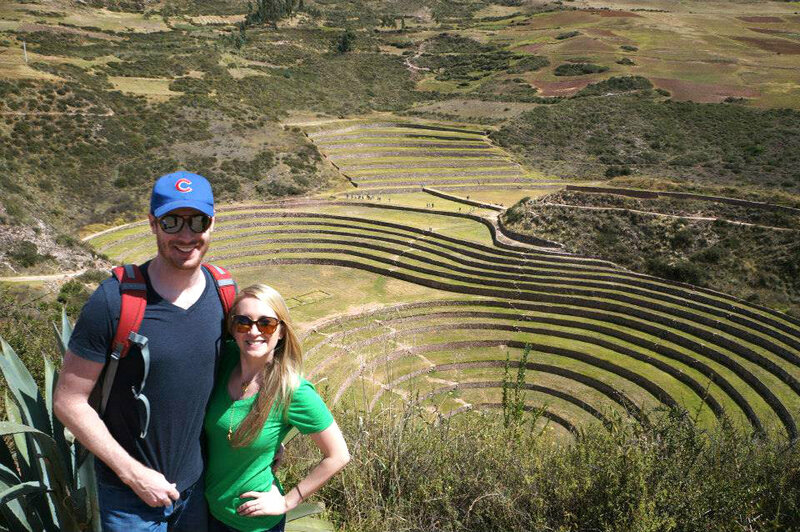 The sacred valley is a gorgeous place if you’re able to make it there! No problem, Lara. Enjoy your trip! This is really a cool and helpful piece of information. Thanks for share. AI am researching a trip to Peru for next year and came across your post. 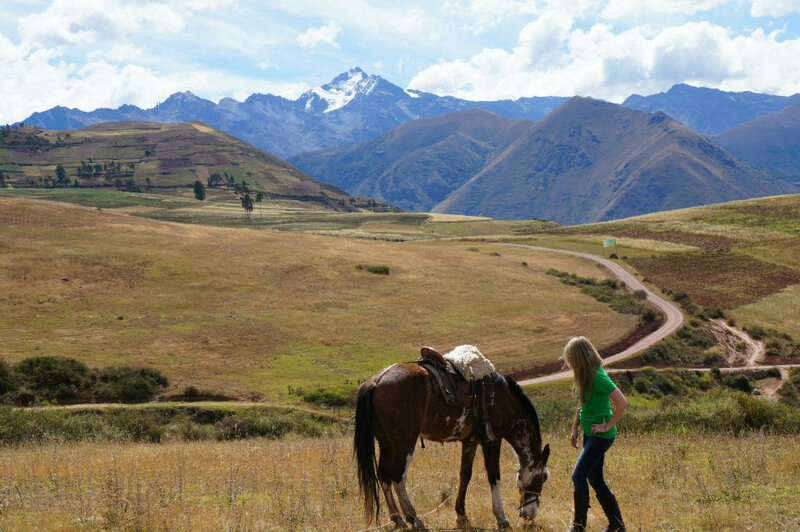 We too would have a free day in a sacred valley before doing the Inca trail and would love to do the tour riding horses. Problem with that is we are absolute beginners in horseback riding. Did you have any experience before doing this trip? Would you think a beginner can do this? I am definitely a beginner, so you absolutely could do it if you have a sense of adventure and can handle a bit of heights (which made me a bit nervous on the horse, but my travel companions were fine and I’m sure you could request a flatter trek if you prefer). Have fun!